Easy to operate, “I” is for blue light , “II” is for blue & white light and the “O” is for turning on/off, you just need to press them as you need for illumination and decoration. With a power adapter, transferring 100-240V AC to DC 12V. Safe working voltage 12V DC, without any risk to people and fishes. Equipped with clamp for mounting on the tank, no need extra wires, easy to install. 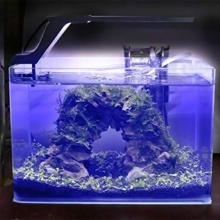 Be excellent for aquarium, fish tank, pool and other similar occasions. IP44 waterresistance is for lamp body, the power adapter is non-waterproof， please use it carefully.